319 Marlborough is located on the north side of Marlborough, between Fairfield and Gloucester, with 317 Marlborough to the east and 321 Marlborough to the west. 319 Marlborough was built in 1874 by Daniel Weeks Beckler, one two contiguous houses (317-319 Marlborough). Daniel Beckler was a builder and lumber dealer. At about the same time as he acquired the lots on Marlborough, he also became proprietor of Beacon Park, a trotting park and race track in Allston, and by 1875 he also owned a stable in Hancock Square in Charlestown. He and his wife, Julia A. (Judkins) Beckler, lived in South Boston in 1874 but moved soon thereafter to Winter Hill in Somerville. They also owned a home in Northfield, New Hampshire, where he raised thoroughbred horses. 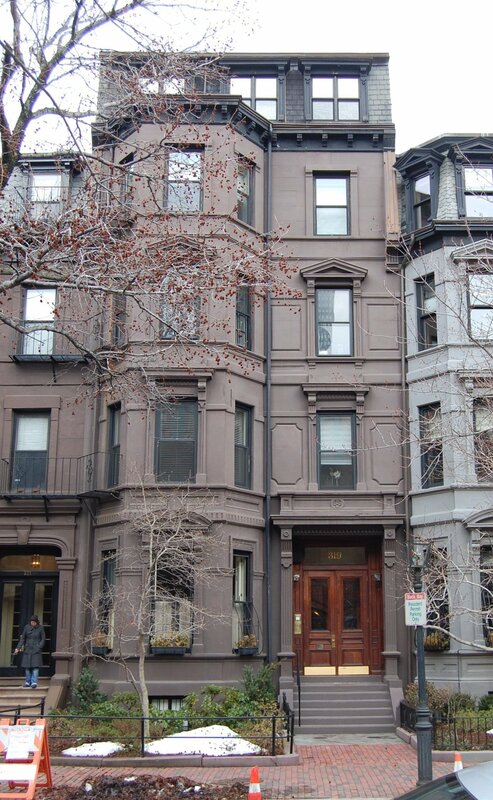 Julia Beckler purchased the land on which he built 317-319 Marlborough on January 1, 1874, from Frederick B. Pope, an architect and builder who built a number of houses in the Back Bay during the early 1870s. Fred Pope had acquired the land on March 11, 1872, from real estate investor Charles Uriah Cotting, and probably had intended to build the houses there himself. The land was part of one of several parcels originally purchased from the Boston Water Power Company on January 29, 1866 by a real estate investment trust formed by John Templeman Coolidge, Franklin Evans, and Charles Henry Parker. Click here for an index to the deeds for 319 Marlborough. The land originally was composed of two lots, each with a 24 foot frontage. Daniel Beckler subdivided them into a 22 foot lot on the east and a 26 foot lot on the west, and built 317-319 Marlborough on them. In October of 1874, Daniel Beckler acquired land to the east of 317 Marlborough from attorney Harvey Jewell, probably with the intention of immediately building additional houses on it. He had overextended himself, however, and in late 1874 or early 1875, he declared bankruptcy and Harvey Jewell took back the land. Subsequently, Harvey Jewell apparently entered into an agreement with Daniel Beckler to construct the four houses at 309-315 Marlborough in 1877-1878 and also to build five more houses in 1878 at 302-310 Marlborough, across the street, on other land which he owned. On March 29, 1875, Alpheus M. Stetson foreclosed on his mortgage to Julia Beckler and sold 317-319 Marlborough to his son, John A. Stetson. Alpheus Stetson was a lumber and coal dealer; he and his wife, Sophia B. (Osborn) Stetson, lived in South Boston. On May 27, 1875, John Stetson sold the property back to his father. 319 Marlborough was not listed in the 1876 and 1877 Blue Books. On August 4, 1877, 319 Marlborough was purchased from Alpheus Stetson by Sarah Elizabeth (Hatch) Rogers, the wife of Charles Alvan Rogers. His father, Alvan Rogers, a widower, lived with them. They all previously had lived in Chelsea. They were wholesale dealers in china, crockery, and glassware. Alvan Rogers died in March of 1885. Charles and Sarah Rogers continued to live at 319 Marlborough during the 1888-1889 season, but moved thereafter to Brookline. On March 16, 1889, 317 Marlborough was purchased from Sarah Rogers by Mary Elizabeth (Cobb) Hayes, the wife of Rev. Stephen Hobbs Hayes. They made it their home and also operated a private school for young ladies in the house. They previously had lived and operated the school at 68 Chester Square. Rev. Hayes had been pastor of the Salem and Mariners’ Church in Boston until his retirement in 1880. An additional story was constructed at 319 Marlborough sometime in the late 1880s or early-to-mid-1890s, probably after the house was acquired by the Hayes family. It does not appear on the 1887 Sanborn map, but is shown on the 1897 map. 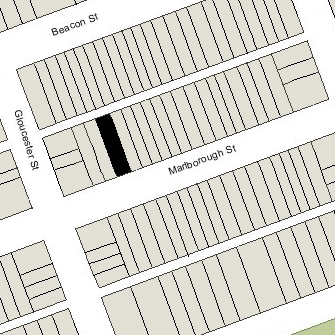 Stephen and Mary Hayes continued to live at 319 Marlborough in 1897, when they moved to Cambridge. She died in August of 1898, and he died in November of 1899. Stephen Hayes had been married previously to Elizabeth (Bean) Hayes, and they had six children, three of whom survived him: Mary Evelyn Hayes, Abby Stanley Hayes, who married Dwight Chamberlain Lyford, and Emily Kendall Hayes who married Charles Frederick Bush. Stephen and Mary (Cobb) Hayes had one child, Millicent Gay Hayes, who married Francis Harold Dike. Based on the deeds for 319 Marlborough, it appears that Mary (Cobb) Hayes left one-half of the property to her daughter, Millicent Gay (Hayes) Dike, one-fourth to her unmarried step-daughter, Mary Evelyn Hayes, and one-eighth each to her married step-daughters, Abby (Hayes) Lyford and Emily (Hayes) Bush. When they moved to Cambridge, Rev. and Mrs. Hayes leased 319 Marlborough to Miss Elizabeth Josephine Woodward and Miss Bertha Hazard. They previously had operated a private school at 5 Marlborough. After Mary Hayes’s death, her estate continued to lease the house to them. Miss Woodward lived at 29 Copeland in Roxbury with her mother, Esther Maria (Carpenter) Woodward, the widow of Edward Tyler Woodward. Miss Hazard lived at 18 Centre in Boston. Elizabeth Woodward continued to operate a private school at 319 Marlborough, known as Miss Woodward’s School. 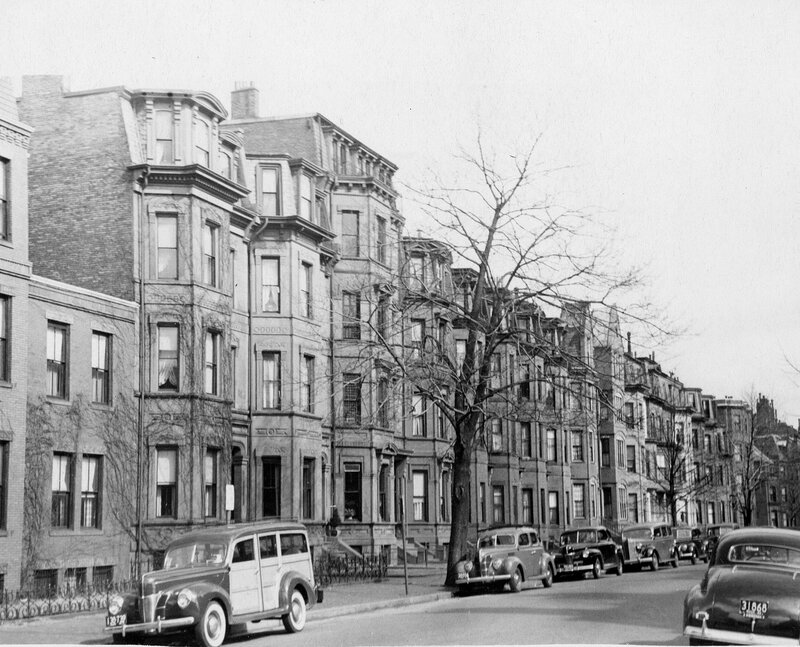 She also continued to live on Copeland Street in Roxbury with her mother until her death in May of 1911, and then at 12 Lyndhurst Street in Dorchester with Mary Pierce, one of the teachers at the school. 319 Marlborough continued to be owned by Mary Hayes’s heirs. Mary Evelyn Hayes died in 1911, Emily (Hayes) Bush died in 1917, and Abby (Hayes) Lyford died in 1917. In 1923, Abby Lyford’s one-eighth interest in the house was acquired by Stephen Hayes Bush, the son of Emily Bush. He was a professor of romance languages at Iowa State University. In June and July of 1927, the Woodward School acquired 319 Marlborough from the heirs of Mary Hayes. Elizabeth Woodward died in January of 1940. She was described in her January 14, 1940, Boston Globe obituary as “principal-emeritus” of Woodward School. The school remained at 319 Marlborough until 1953. On July 20, 1954, 319 Marlborough acquired from the Woodward School by Joseph A. Gautreau and Stuart H. Hastings. In August of 1954, Stuart Hastings applied for (and subsequently received) permission to convert the property into seven apartments. The property changed hands and on December 20, 1957, was acquired by J. Phillipe Pomerleau. On December 7, 1958, the fourth floor was badly damaged by a fire. On January 5, 1963, 319 Marlborough was acquired from J. Phillipe Pomereau by David C. Keating and his wife, Joan M. Keating. On April 7, 1965, it was acquired from them by Jack Eadie Molesworth. Jack Molesworth was a philatelic dealer specializing in Confederate stamps. A leader of the ultra-conservative Young Americans for Freedom and a Republican State Committee member, he was an unsuccessful candidate for Congress in 1964. He and his wife, Phyllis (Carpinteri) Molesworth, lived in an apartment at 88 Beacon. On June 12, 1978, 319 Marlborough was purchased from Jack Molesworth by G. Raymond Ahrens, trustee of the 319 Marlborough Street Trust. That same month, he applied for (and subsequently received) permission to remodel the property into five apartments (consolidating three existing apartments on the first floor and basement levels into one apartment). On November 28, 1978, he converted the apartments into five condominium units, the 319 Marlborough Condominium.